Join us at Bristol Soapbox Science 2014! Bristol is a great city for science – a world-class research University, science museum and botanical garden to name but a few reasons why. But how much do the public really know about what goes on at these research institutes and who is it that they imagine is working there? Unfortunately, the public’s stereotypical view of scientists is matched by the reality. The vast majority of senior academics are middle-aged and male, despite science being a popular choice for female students through to the level of a PhD. It is the mission of Soapbox Science to remove this gender inequality still present in science today by raising the public profile of women in science and challenging the views of careers in science for women. Behind office and laboratory doors of our city and its surrounds, there are some wonderful women doing some wonderful science that could inspire a new generation. Could you be one of them? 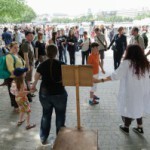 We are currently on the look out for inspiring speakers from Bristol and the surrounding West Country to be Soapbox Science Speakers at our event on Saturday June the 14th, at the fabulous Millennium Square during Bristol’s Festival of Nature celebrations (http://www.bnhc.org.uk/home/festival.html). The exciting expansion of Soapbox science to several UK cities in 2014 means that we will be able to provide even more opportunities for women around the country to stand up on a soapbox and share their work with the world! If you are interested in joining us as a Speaker at our Bristol event please apply via the form available on this website (check our home page!) and send it to soapboxsciencebristol@gmail.com. Deadline: 28th Feb! This entry was posted in Event promotion. Bookmark the permalink.